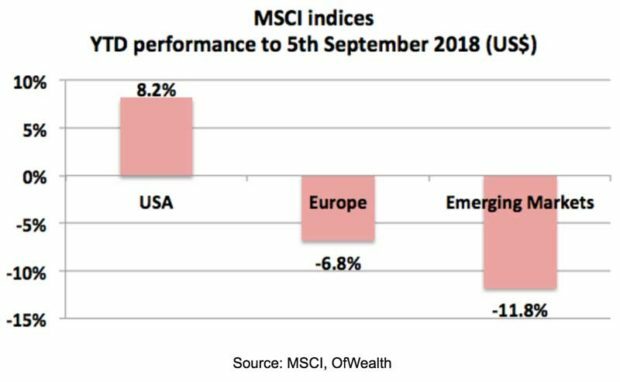 During 2018, up until May, the world’s major stock markets had similar performance. Since then, the US has pushed higher whereas most other markets have sunk lower. That performance gap widened considerably during August and early September. Today I give a snapshot of what’s happened, and why it could lead to big opportunities. 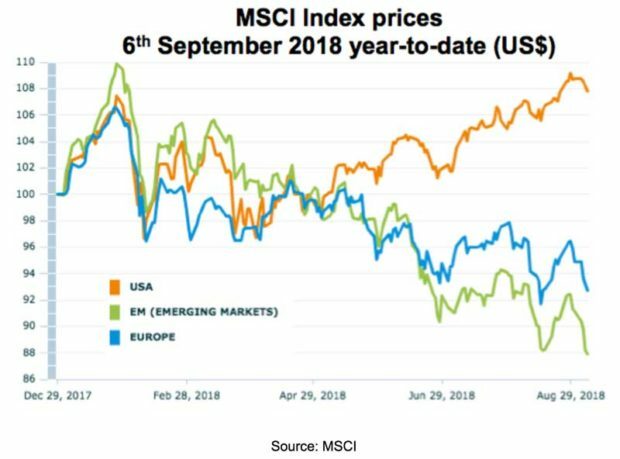 First, here’s a chart that compares the price moves of some major MSCI Indices since the start of the year: the USA, Europe and Emerging Markets. It clearly shows, at the macro level, how performance has diverged since May, especially when measured in US dollars. There have been a lot of headlines about dramatic falls in certain emerging markets, but it’s clear that other places have underperformed as well. As you’ll see below, performance is very mixed, depending on which country we look at. 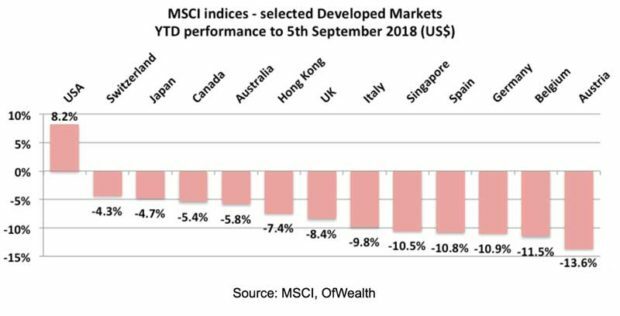 I’ve had a look at the performances of regional and country MSCI indices for the year-to-date, up until 5th September. This next chart compares 2018’s dollar price moves for the US, Europe and Emerging Markets. A lot of that fall in Europe can be put down to currency moves. 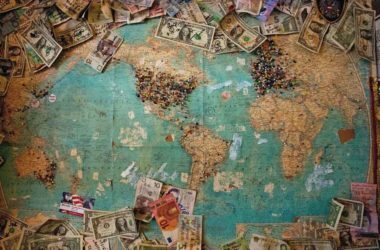 The dollar strengthened against most currencies during 2018. 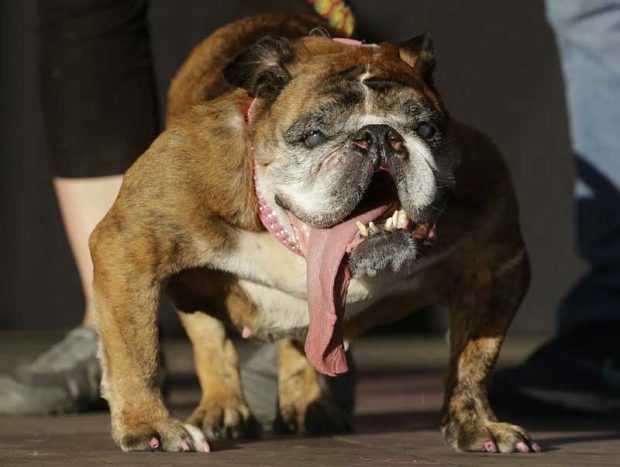 For example, the euro lost 3.1% against the dollar and the British pound is down 4%. That said, the Swiss franc and Japanese yen have held their ground, up 0.2% and 0.9% respectively. Digging in one more level, below is a chart of selected developed market performances so far this year. Apart from the US, it’s red ink across the board (although remember that these figures are price moves only, and exclude dividends received). The smallest falls have been in places like Switzerland, Japan and Canada. In the case of Canada, most of the fall can be attributed to the Canadian dollar, which is down 5% against its US cousin. Bigger developed market falls have occurred in Singapore, Spain, Germany, Belgium and Austria. European markets have taken hits from things such as trade tensions with the US, the currency crisis in nearby Turkey and continued fears over bank solvency in Italy. What’s driven Singapore’s fall is less clear. The Singapore dollar has lost 3% against the US dollar, despite Singapore’s rock-solid finances (and the USA’s escalating budget deficits). At the end of August the MSCI Singapore index had a price-to-earnings ratio of just 13 and a dividend yield of 4.2%. I intend to take a closer look. It could be a good hunting ground for bargains at this level. Let’s move on to the emerging markets. Here’s another chart of selected index price performances so far this year (again, all in US dollars for comparability). You can see right away that’s it’s a very mixed bag. Countries such as Colombia, Malaysia, Thailand and Mexico have so far escaped the carnage. Argentina and Turkey have completely collapsed, and been cut in half. Many countries are down over 20%, including Brazil, Indonesia, Greece and South Africa. Argentina is technically a frontier market. But MSCI, the index provider, has already announced it will be upgraded to an emerging market from May 2019. The Argentine stock market collapse is no mystery: the country has had a currency crisis and the peso has been cut in half. Even with the big fall, I still think Argentine stocks are overpriced for the high-inflation environment, expected to come in around 40% this year (for more, see here). Turkey also had a currency collapse. Problems have built up for years – both financially and politically. But the final straw was US sanctions, imposed due to the ongoing detention of an American priest that’s accused of taking part in a 2016 coup attempt against President Erdogan. It’s also next door to Syria, where there’s ongoing risk of confrontation between US and Russian armed forces (whether by design or accident). South Africa has entered the limelight due to government plans to confiscate farmland from professional farmers and redistribute it to the populace. Zimbabwe did this a number of years back, leading to a collapse in agricultural production and a currency crisis that ended in hyperinflation. Greece is still shackled to the euro and drowning in government debt (179% of GDP). A decade after the global financial crisis, the economy is still a quarter smaller than previously. The Greek depression continues. Indonesia’s currency, the rupiah, has 9% against the US dollar this year. Despite a fall of 24%, Indonesian stocks can hardly be described as a bargain. At the end of August the index had a trailing P/E of 16.6, which isn’t exactly cheap. That said, in dollar terms the market has now gone sideways since the start of 2011. I plan to take a closer look. Brazil has plenty to concern investors. Although inflation is relatively low (4.2%), the political situation remains highly uncertain. Presidential elections happen in October. The leading candidate in the polls, Luiz Inacio Lula da Silva (“Lula”) is in jail for corruption, and so far banned from running (subject to a final appeal). The unjailed poll leader is Jair Bolsonaro, a populist that the media usually describes as “far right”. He was stabbed in the guts this week during an election rally. Brazil looks like a powder keg of social tensions right now, and I still recommend staying away. Now, some comments on a couple of other notable markets that have actually held up pretty well. Russian stocks are dirt cheap (P/E of 6 or 7, dividend yield 5.5%). That was already the case at the beginning of the year, which probably explains why they’ve only fallen 6.6%. On a valuation basis, Russian stocks are a steal. However, significant risks remain of further sanctions from the US or EU, or a confrontation with US forces in Syria. I continue to recommend staying away until there are clear signs of better relations between the US and Russian governments. India has also held up well, with stocks down just 4.7% in dollar terms. This is a surprise to me, given all that’s gone on in the markets. At the end of August the MSCI India index had a trailing P/E of 25 and dividend yield of just 1.2%. 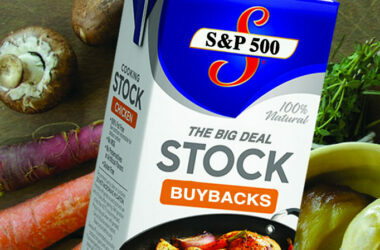 Indian stocks remain expensive and tend to be pretty volatile, so I think this could be the next big shoe to drop. Again, I recommend investors stay away for now. September is often a tricky time of year for global stock markets. 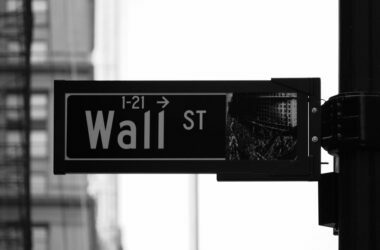 Professional traders and fund managers, in the dominant financial markets of the northern hemisphere, seem to come back from summer holidays in a different mood. Plus the US has midterm elections coming up in November, so the volume of political jockeying is likely to get turned up to 11 over the next couple of months. US trade tensions with the EU and China continue as well. Also, US consumer price inflation remains above target and wage inflation is picking up too, indicating that further rate rises are likely. This will tend to keep the dollar on an upwards trend, weighing on stock prices in other countries (in dollar terms). However, going into next year there could be some great opportunities. Emerging market index funds (at least those based on MSCI indices) will include Argentine stocks from the middle of next year. If Argentine stocks fall another 20% from current levels, the currency stabilises and the political situation calms down, front-running the country’s elevation to emerging market status could be a great opportunity. Certain other emerging markets could present bargain basement entry points as well – but it will be on a case-by-case basis. In the meantime, on the developed market side, there are more and more bargains to be found across Europe. Just like the US – in fact, perhaps more so – Europe is full of companies with big, global businesses (including in the US itself). In many cases the prices no longer reflect that. When index investors, in passive funds, pull out of the market, the selling is indiscriminate. A lot of stuff gets cheap. Opportunities then abound. I’ve recently shown that US stocks are much cheaper than headline valuation ratios indicate. Once you strip out expensive tech and big bubble stocks like Amazon Inc. (NASDAQ:AMZN), the rest of the S&P 500 is trading around its historical median level (see here for more). Price falls mean new opportunities for profit. Europe, Argentina, Singapore and Indonesia are just some of the potential hunting grounds. Not to mention a lot of areas of the US market. There’s no question that, so far, 2018 has been a tough year for many of the world’s stock markets. 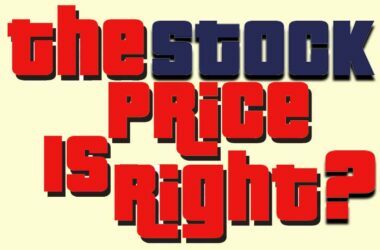 But big price falls are the prelude to big price gains. I’ll certainly be looking out for new opportunities in coming months. Previous ArticleFrom the Amazon bubble to the gold mining bustNext ArticleAt this level, does Amazon stock make sense?